It is made from 204 tiles in 1 colours, with a nominal size of 23cm wide x 23cm high (approx 9 x 9 inches) and a 15cm x 15cm mirror. 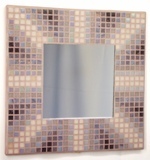 Although this shop is for UK customers only, this mosaic design can be shipped to Europe, USA, Canada, Australia and other countries - order online at Golden Spring 23cm on Kaamar.com (or if you prefer, use the quote button on the right to ask for a quote). This photo shows the Golden Spring 23cm Mosaic Mirror, in the Satin Edged format for wall hanging. 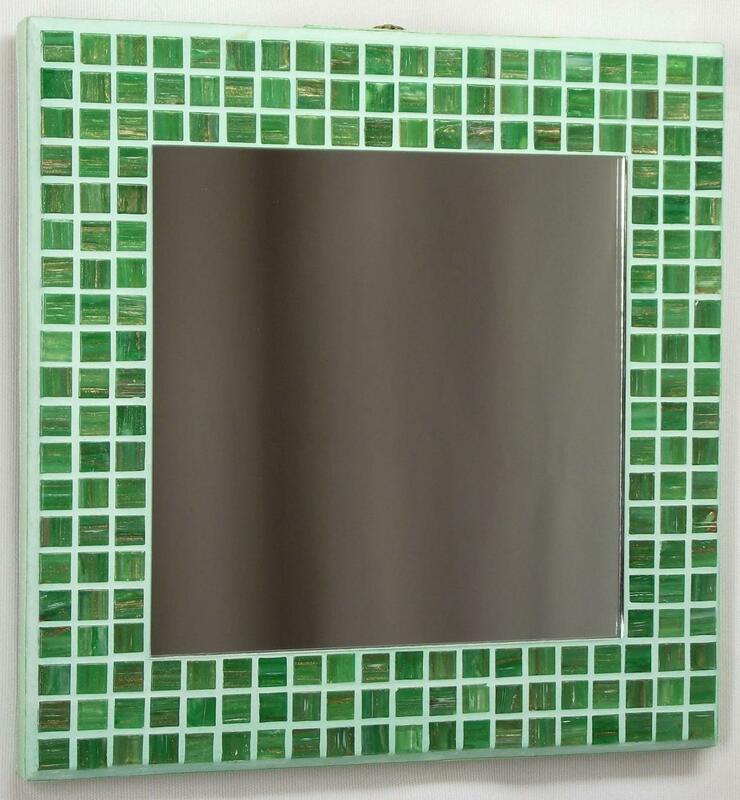 This photo shows a side view of the Golden Spring 23cm Mosaic Mirror in the Satin Edged format. Golden Spring uses spring green marbled tiles with metallic gold highlights. An interesting visual effect is created by the random nature of the Marbled tiles used, with no designated pattern. These special tiles can add sophistication, individuality and sparkle to the design - the glass tile has part of a swirl of base and highlight colours encapsulated within, like a micro snapshot of dyes mixing with water, often giving a marble-like effect. The effect varies greatly between tiles, from almost transparent with a hint of colour, through being a solid base colour to being mostly one of the highlight colours, though most have some level of streakiness. Apart from Pink, all tile colours include a metallic colour as one of the highlight colours, mostly a metallic gold colour, so the design can come to life with a subtle sparkle. Each tile is so different, with random variations in strength and orientation of base colour and highlight colour streaks, that each mosaic is unique and your mosaic may not be an exact match for image shown. Mirror Size: 15cm x 15cm approx. Grout Colour: Light Green 25GW. Overall Size: 227mm x 227mm x 22mm approx. Overall Size: 227mm x 227mm x 28mm approx (with stand closed). Standing Size: 23cm wide x 21cm high x 17cm deep approx. For delivery to other countries, to the excluded remote areas or if you require additional delivery options such as Saturday/Next Day/Before 10am please order online at Golden Spring 23cm on Kaamar.com.